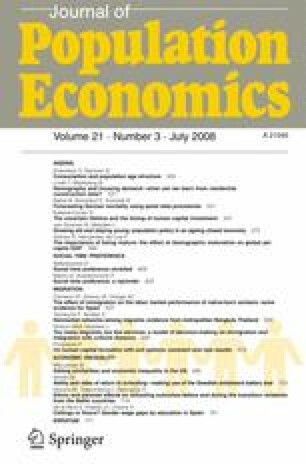 Given that savings behaviour and worker productivity have strong life-cycle components and given that demographic profiles vary across countries, population age structure should be linked to differences in levels of economic development. In this paper, we measure the economic importance of age structure variation for the global economy. We find that demographic maturation has been associated with nearly half of the evolution of global per capita GDP since 1960. We also find that age structure differences can account for just over half of the variation in worldwide per capita GDP (i.e. the lack of sigma convergence) observed since 1960. We are particularly grateful to our anonymous referee(s) and the editorial guidance of Junsen Zhang. We are also grateful to Isabel Argimón, Susanto Basu, Cristina Barceló, Olympia Bover, Ignacio Hernando, Morley Gunderson, Eloísa Ortega, Gabriel Pérez Quirós and Javier Vallés for their suggestions and comments and all participants of the seminar at the Research Department of the Banco de España. The helpful research assistance of Wanja Eiche, Kenny Sandorffy and Konstantinos Tzioumis is greatly appreciated. An indicator variable is constructed whereby countries with more that 36% of the working age population prime aged are assigned 1 and 0 otherwise. An indicator variable is constructed whereby countries with more that 65% of the population aged 15–64 are assigned 1 and 0 otherwise. Log of real GDP per capita is a chain index (in 1996 *$US prices). For more details, see Data Appendix in Penn World Table 6.1.
aDemographic data based on United Nations World Population Prospects. A full account of all variable definitions can be found in Table 4 of Appendix 1. The GINI measures for 2000 are for 1990. Numbers in brackets in rows 10 and 11 are the all-country (global) variance measures. aWe have used the most recent designations for countries such as Czech Republic and Slovakia (formerly Czechoslovakia) that have subsequently changed names and/or split from larger federation(s). The United Nations provides separate demographic statistics, based on reclassifications of census data, for these ‘new’ countries going back to 1950. However, in the Penn World Tables, most of these countries do not have independent economic statistics until they were newly formed and therefore only appear in our unbalanced panel estimates when GDP figures became available.